The funeral of Abdullah Faisal Omar Tawalba took place on Tuesday February 5th, less than a day after he was killed by Israel’s occupation forces at a checkpoint on the entrance to his home village of al-Jalama. Israeli occupation forces’ soldiers opened fire on Tawalba while he was riding a motorbike with a younger friend. Tawalba, aged 19 or 21, was shot in head and multiple times in his feet while 15-year-old Omar Ahmad Hanana was moderately wounded with a bullet passing through his torso from the wais to shoulder. Abdullah Tawalba was possibly left to bleed without medical aid by the Israeli occupation, which eventually allowed Palestinian medics to evacuate him and Omar Hanana. 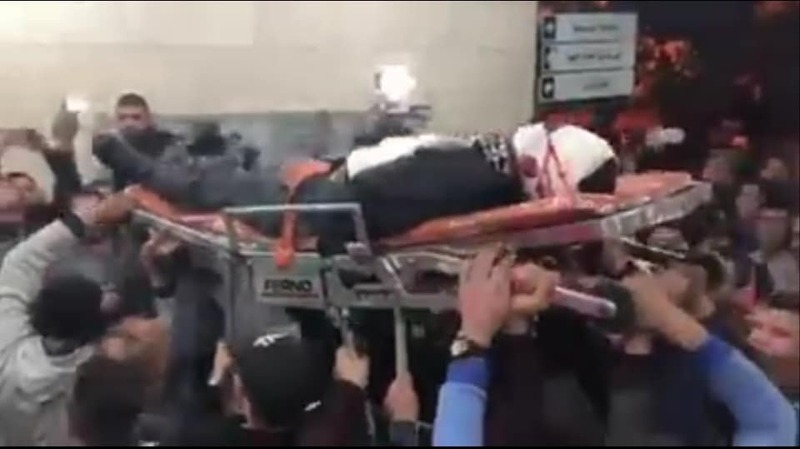 According to contradictory information Tawalba was dead by the time he arrived to a hospital in nearby city of Jenin or died there; photographs would seem to indicate that he had died in the ambulance, where efforts to treat his head wound had been done based on bandages. Israeli occupation claimed at first that the youths would have ‘opened fire’ at the occupation soldiers, but this evolved into them ‘throwing an explosive’ before the occupation settled on the claim that the boys had ‘thrown a suspicious object’. No evidence for any ‘suspicious object’ has been given.